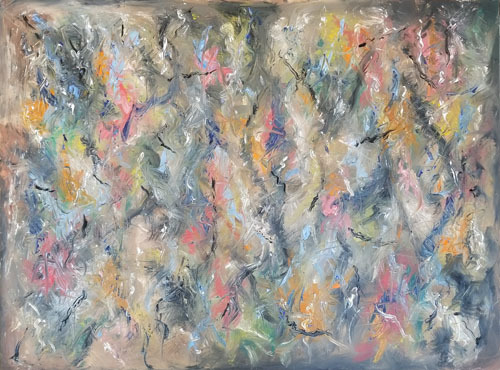 This painting is called “Homage to DeKooning 7.” It’s this artist’s seventh painting using this brush/palette-knife technique while varying the color relations between “background” and “foreground.” To illustrate, here’s an earlier painting in this series. 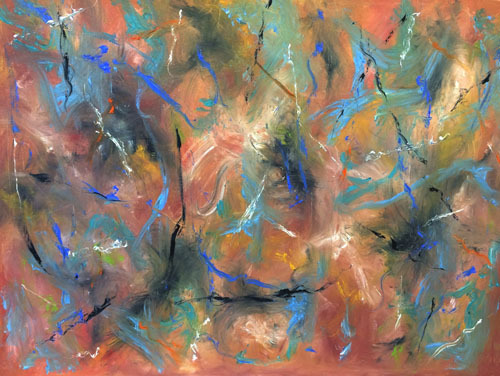 These paintings are fairly large, 30”x40.” I think paintings like this, should be seen close up, about two or at most three feet away, so that you feel immersed in the painting. If you do this and also don’t rush yourself, you will experience a sense of space within the painting that obviously has nothing to do with perspective. You can then reflect on why your brain would conjure up this space sensation when nothing like a horizon or receding Renaissance columns or mountains in the distance are depicted. This is what makes abstraction—true abstraction, not simplification—endlessly fascinating: you’re looking at the games your mind plays. *I’ve actually heard a man say “my five-year-old can do that” in front of a Picasso at the Art Institute. Paintings by Bruce H. Boyer. Just try! Look at this and try being bored. Try harder. 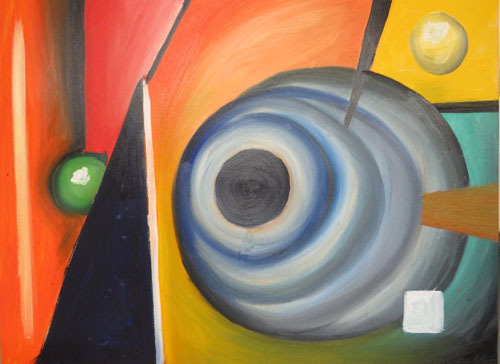 The previous post’s painting might have been titled “Untitled I.” I think all abstract paintings are best left untitled, but we have to catalog them and for that purpose they need an ID. Notice how lame the title “Stretch” is for this painting. Why not “Two Kites” or “Yellow and Blue” or “Two White Lines and Three Black Lines” or “Some Orange Fireworks?” All equally lame. Attempts at metaphysics would lead to titles like “Inner Conflict” or “Revelations” or “Finding My Way.” Even worse! The reason titles that try to be descriptive are so bad is that the painting is not descriptive of anything. The painter is not trying to describe or illustrate anything. In naming my own paintings I have taken an absurd route, determined to avoid descriptive lameness. http://katherinehilden.com/notes.html. The result is that I cannot remember the titles of my own paintings, which is what I want. I have to remember them visually. This is the second of twelve consecutive posts featuring the work of Bruce Boyer. I want everyone to be able to scroll down and see this work as uninterrupted by verbiage as possible. I’ll comment occasionally, but sometimes not at all. Let this simulate a gallery experience. All paintings are 30”x40” and were produced earlier this year, from January to May, but will not be posted in the order of their production.